McMeans aims to generate a feeling of healing calmness through her work. 3D cardboard cutouts are enlivened with choice colors of the Southwest and its majestic landscapes to create an uplifting, tranquil sensation and mindset. Her unique manipulation of acid free cotton-based corrugated board, or cardboard, manifests a life-like dimension and texture with a playful, surreal, and simplified aesthetic. Mountainous geography, flora, and fauna are reduced to minimal geometric shapes and hues to accentuate the warm glow and humble shadows of eventide, and to deliver a relaxing yet vibrant visual. Given the complex and tedious nature of her cardboard works, McMeans has integrated hand crafted stencil work into her artistic practice as well. 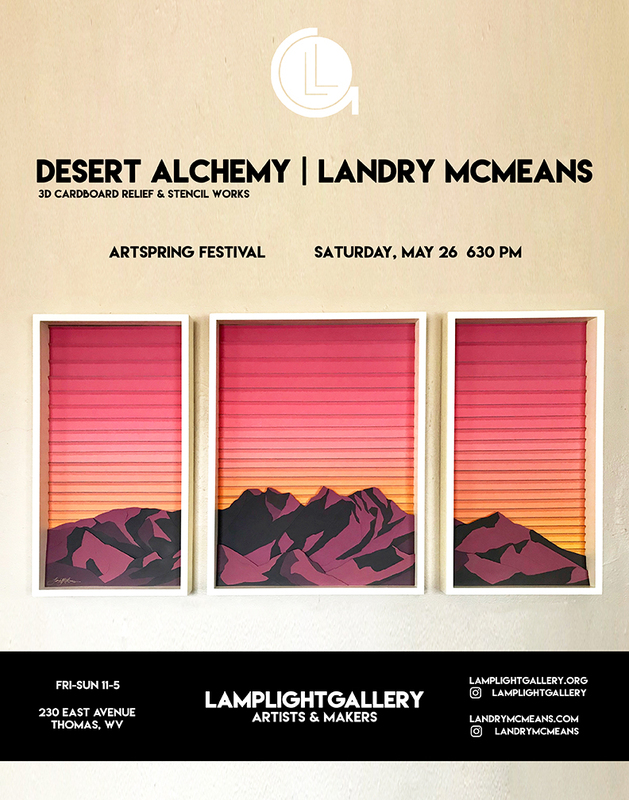 The stencils serve as a more accessible and simplified 2-D vision of her 3-D work, reminiscent of the National Parks vintage postcard collection, which has been a significant source of inspiration for McMeans’ artistic direction.